When Microsoft announced the release of .NET as open source and also to make it cross-platform compatible, that was fantastic news for many software developers and IT people. For me it was a great day in (software development) history. It is a smart move from Microsoft. I find the combination of C# and .NET to be very productive and state of the art. If you look at the great article If Programming languages were weapons, you will see C# described as a “powerful laser rifle strapped to a donkey,” Soon you may hook your laser rifle to a penguin or an apple. If the donkey was your concern, those days will be over soon. We can say that the jump from 4.5.2 to 4.6 (labeled 4.5.3 as a preview version) indicates that the amount of changes is greater than that from 4.5 to 4.5.1 and 4.5.2. On the other hand, it is not a major release and spectacular innovations are not to be expected. 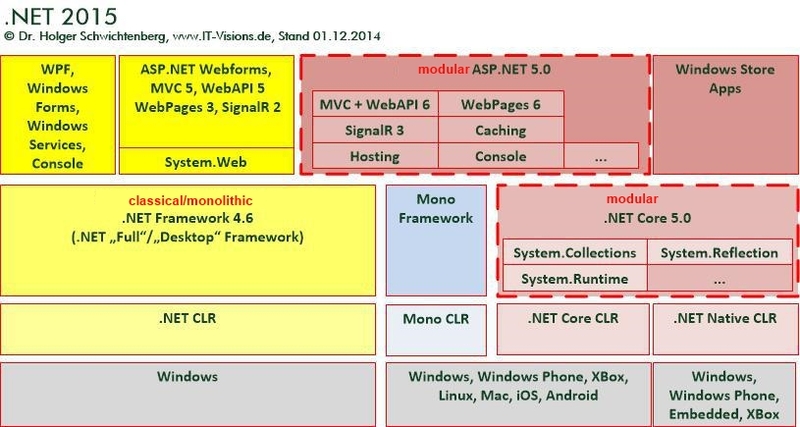 Have a look at the .NET Framework Blog. For C#6, we have a couple of boiler plate reducing new language features, which can be seen here: http://msdn.microsoft.com/en-us/magazine/dn802602.aspx. Unfortunately, as announced here, primary constructors and declaration expressions will not be in the final release. Have you tried Visual Studio 2015 with C#6 already? Download it from Microsoft. .NET Core 5 is the name for the cross-platform stack of the .NET framework. This will contain a limited set of libraries which will run on Windows, Windows Phone, Xbox, Linux, Mac, iOS and Android. As you can see by looking at the many supported platforms, you can already guess that Windows Forms and WPF support is not included. Instead, .NET Core 5 focuses on web and mobile development. At least for now, we do not know Microsoft’s exact plans.